We’re delighted to present a special commission in association with The Prince’s School of Traditional Arts: Spring in the Season of Love. In this performance, Love is celebrated through its many stages of union, separation, quarrels, and reconciliation with unmitigated passion. We present to you the story between the lady we know as the Nayika and her beloved, the Nayak. This is a unique concert which weaves the theme of Love through paintings, music and storytelling. Dr Vayu Naidu’s enthralling storytelling, inspired by Indic folk and epic literature, will take you on journey of different emotions experienced in all aspects of love, through a vibrant collection of Ragamala miniature paintings. 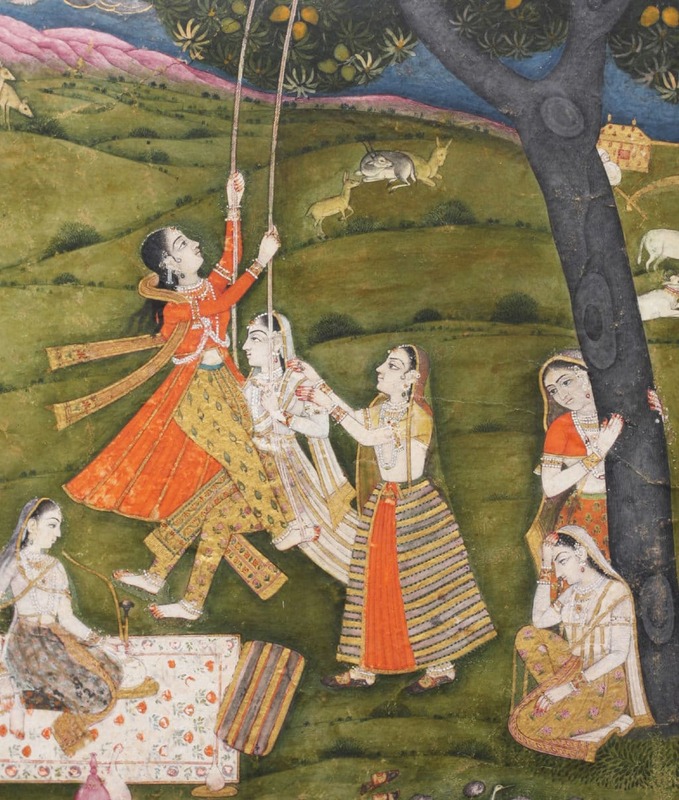 This type of painting depicts a specific type of Indian musical mode (raga), which is represented through colour, a mood, and a verse describing a story of the nayika and nayak. It also is associated with a season and a time of the day. With a carefully chosen selection of corresponding bandishes, (the melodic compositions of Hindustani vocal music), Meeta Pandit’s mesmerising singing will be carried by Sanju Sahai on tabla, Rekesh Chauhan on harmonium and Mitel Purohit on dholak, Darshana Vora and Dipti Vyas on tanpura. Meeta Pandit is an acclaimed Hindustani Classical vocalist who belongs to the Gwalior Gharana. Granddaughter and disciple of Pt Krishna Rao Shankar Pandit, and daughter of Laxman Krishnarao Pandit, she is the sixth in the unbroken lineage and the first woman in the family to have taken up music as a profession. Her voice, both melodious and robust, whose vocal range stretches over three octaves, and her beautiful raga handling have won her critical acclaim and awards. Dr Vayu Naidu is a performer, storyteller, playwright and novelist. Her PhD completed in 1994 at the School of English, Leeds University explored Indic oral traditions in contemporary western theatre and their resonances. Her special interest is in transposition of cultural sensibilities. Vayu brings to life epics and myths from world literatures through innovative performances combining different art forms; storytelling, theatre, music, dance, and visual arts.